I'm currently spending the weekend with my parents, so I scheduled this post in order to have a post up for you even though I'm not on my laptop for the weekend. As I'm still working on the rest of the costumes, you are getting a nail art post. But don't worry, I promise to get the costumes up soon too. I'm actually hoping to get one photographed with the help of my mom if there's good weather outside. It would make such cool pics if I could do it outside. But anyways today, let's focus on nails, okay? Since I feel everyone and their mom is doing dark nails for Halloween - myself included - I figured I would do something a bit different. That means colorful nails inspired by sugar skulls and Day of the Dead, which is close to Halloween anyway, but also has been inspiring makeup artists the past few years. 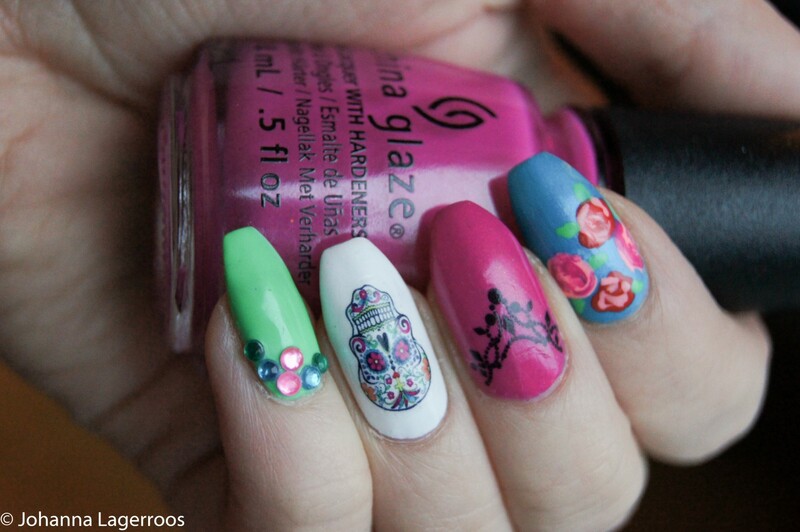 I've done a sugar skull look myself as well (see here), but this year I wanted to adapt it on my nails. 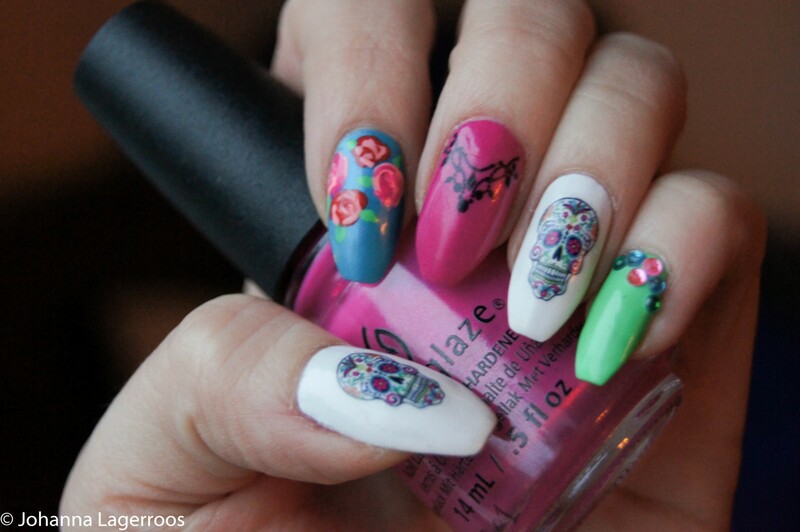 As you can see, I draw my inspiration from the skull decals and tried to bring the same colors they had on to the nails. Then I added some painted roses, jewelry decals and of course rhinestones. Again, this was very simple mani even though it may look complicated to some. 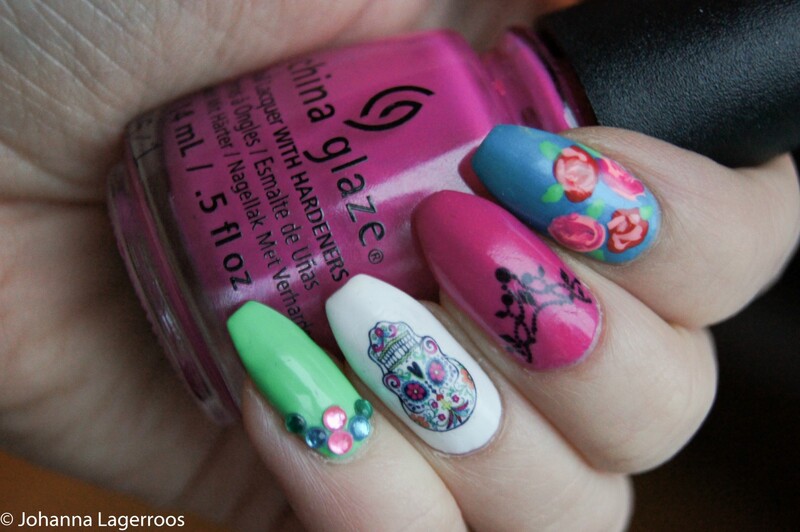 The hardest patterns are done by water decals and even the roses were painted a super simple way. Trust me, anyone out there could do these. I really have to shoutout these decals. They are yet again from Shop Keeki, which so far has been my favorite place to get my water decals because the quality has been really good even with items that have sat on my drawer for a while. 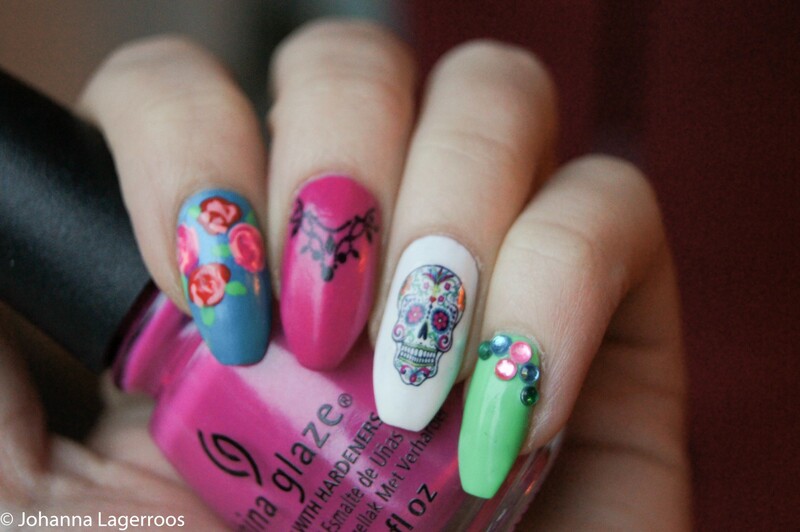 Like these skulls. You can get the same decals here. I really liked how these nails turned out. As much as I love dark nails all year every year - especially around Halloween - I still enjoyed doing something quite different. And I think this is nice for those of you who like to do something cool for Halloween but don't really feel for the super creepy and dark stuff. The polishes I used for these were all by China Glaze, and the shades are White Out (the white), Bite Me (the pink/magenta), Towel Boy Toy (the blue), Treble Maker (the green), Feel The Breeze (the lighter pink) and Flame-boyant (bright red). The jewelry looking decal is also from Shop Keeki, and the colorful rhinestones are from Born Pretty Store (I think). What do you all think about these nails? Let me know in the comments! Also let me know if there are Halloween nails you would like to see me make, so maybe I can do those next! 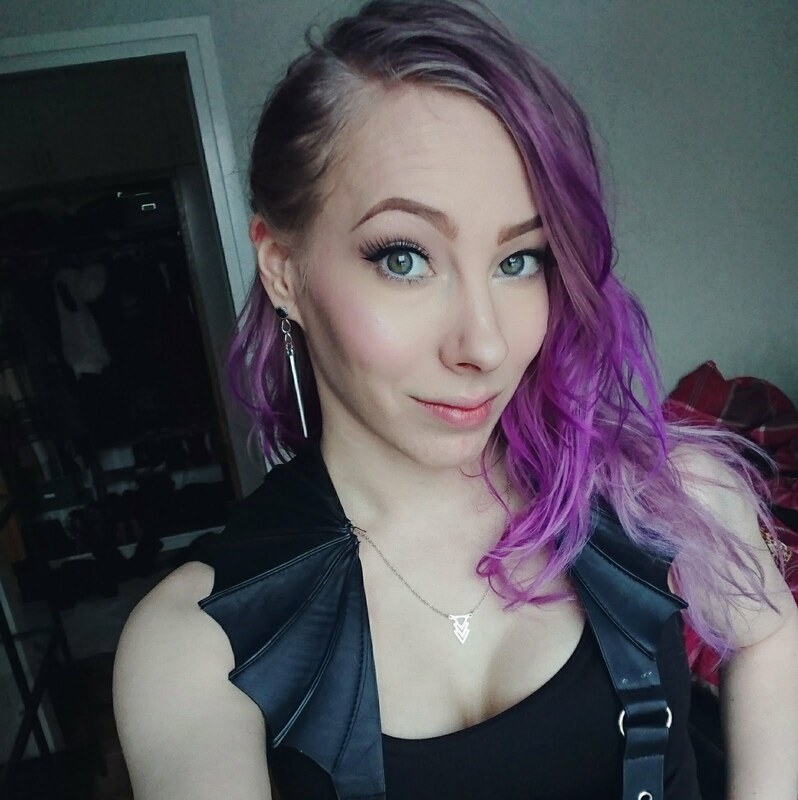 That's all for today, but in a couple of days I will be back with another costume post. I may put up sneak peeks on my Instagram @silvertigo, so follow me there as well. See you all in a next post! 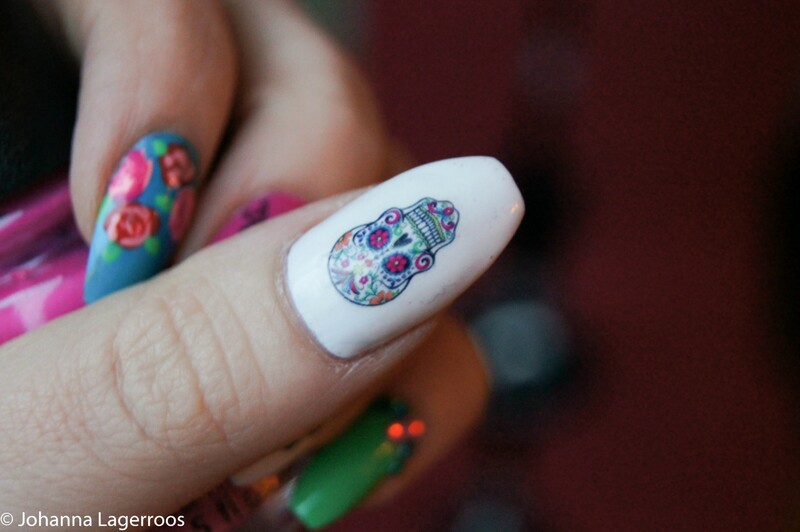 The sugar skull on white is so pretty and I like how you mixed and matched this mani.